Spondylolysis is more common in young athletes involved in sports such as throwing, tennis, baseball pitchers and fast bowling in cricket. 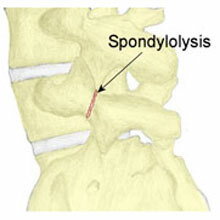 Spondylolysis in both sides of the spine is often associated with Spondylolisthesis or a forward slipping of a lumbar vertebrae. Lower back pain often on one side of the back, although in some cases there may be no painful symptoms. Pain is made worse by activities which involve bending the spine backwards (extension). A sudden onset of pain resulting from a specific back extension activity. Hyperlordosis or an increased lumbar curve in the spine may be present. Pain may be reproduced when standing on one leg (the painful side) and leaning backwards (into extension) with the aid of the therapist. Tenderness over the site of the fracture when pressing in. The fracture usually occurs on the opposite side to the aggravating activity, for example, it would be on the left of the spine for a right-handed thrower. Diagnosis may be confirmed by X-ray although a recent injury may not always show up. A bone scan or better still, a ‘single photon emission computed tomography (SPECT) scan can give a more accurate image. Pars defects can be split into early, progressive and terminal stages depending on the severity and age of the injury. It is important to make an early diagnosis with a pars defect as most cases of early-stage pars defects will heal resulting in bone re-union. A fracture on one side only is more likely to heal than conditions where there are two fractures, one on each side of the spine. Fractures at the L4 vertebra are more likely to heal than those at L5 (the lowest vertebra). Rest from aggravating activities or sports. Stretch the hamstring and gluteal muscles. Strengthen core muscles of the abdomen and lower back as soon as pain allows (very important). Some therapists would argue against the use of back support braces. When the movements which resulted in pain (extension and rotation) can be done pain-free then a gradual return to sport specific training can be made. Changes in the athlete’s technique should be made where appropriate to help prevent the injury from returning.